Goals are extremely good and cool. No one other than the occasional massive weirdo goes to the football to see a grinding, low-scoring war of attrition between two defensively-minded sides. Despite this, scores have been falling for the past decade or so, as tactics like flooding and its various tedious descendants have come into fashion. 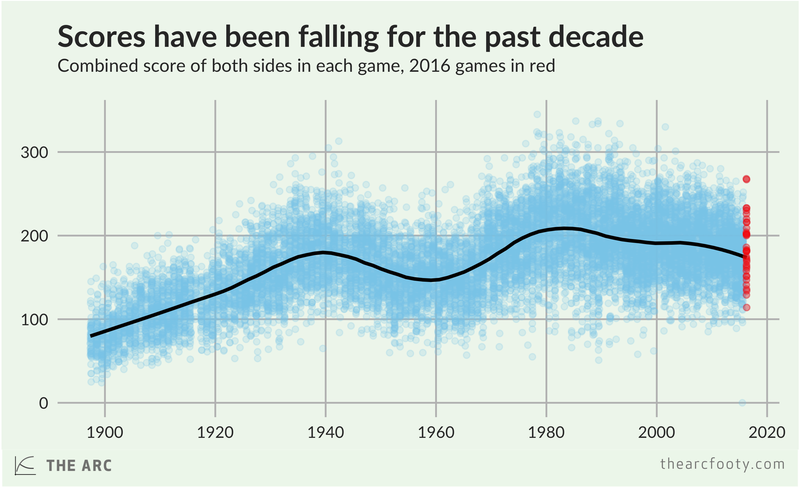 The typical combined score of both teams in a game in 2015 was down to early-1970s levels, which is a Bad Thing. The AFL must agree that goals are good and cool, because they’ve made some rule changes that aim to generate higher-scoring play. As we’ve already established, the changes have succeeded in achieving their other goal, a reduction in stoppages. It looks as if they’ve succeeded in increasing scores, too. 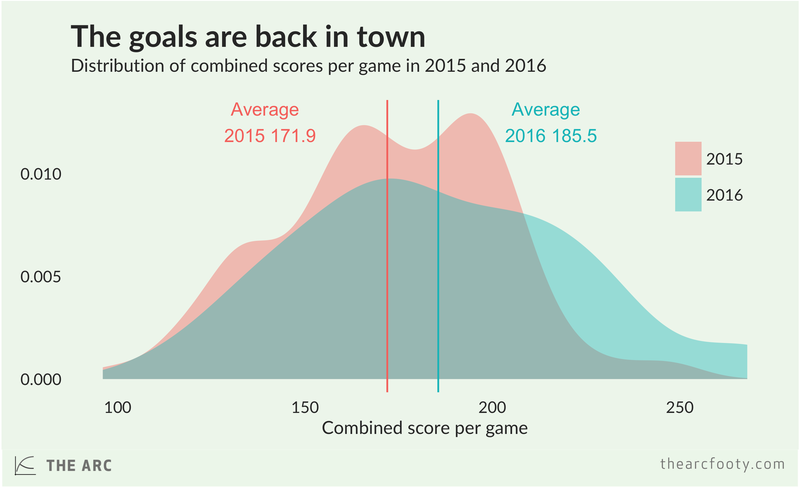 The average combined score in games in 2016 is two and a bit goals higher than the average in 2015. After three rounds, we have a big enough sample (36 games) to be reasonably sure that this difference in average scores isn’t due to chance [for the nerds, t = 2.934, associated p-value = 0.004, two-tailed test]. It turns out that scores have risen for both losing and winning teams. The average score of losing teams has risen from 67.2 to 74.9, an extra 7.7 points per game, while the average score of winning teams has gone from 105.5 to 110.7, just under an extra goal per game. The goals are back in town! The new rule changes are helping to make what we (ie. me, Matt Cowgill) at The Arc think is a Golden Age of AFL Football even more golden. Previous article	← The AFL is trying to reduce stoppages. It’s succeeding.